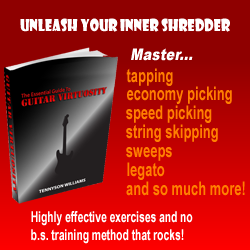 Are you tired of a lack of results from your guitar practice? This frustration is one of the most common amongst guitar players and happens to everyone at least once in their journey to improve on guitar. In order to become a better guitarist, you will need to eliminate any of the poor guitar practice habits you currently have and replace them with habits that will help you get the most out of every minute you spend practicing. That said, if you are looking to get better at guitar; your best bet is to ask advice from a true pro who has been helping guitar players reach their musical goals for years. That’s why I recently contacted Tom Hess, guitarist in Rhapsody Of Fire and guitar teacher to hundreds of students around the world. After exchanging e-mails, I decided it would be a good idea to arrange an interview with him where he could discuss and share his ideas on the topic of guitar practice. Tom’s review and advice: If you are feeling like you are taking on too much information now, it will not be helpful to continue piling on even more! Fact is, being effective in your guitar practice is just as much about organization as it is about the actual information you are studying. With this in mind, work on finding a good method for organizing the materials you have right now into an efficient guitar practice system. While designing this system, think about not only the general goal that you want to achieve but also the specific shorter term obstacles in your playing that must be overcome to reach the final result. Your practice schedules should organize your practice materials to enable you to conquer the short term obstacles, thus getting you closer to the main goal. Tom’s review and advice: This is a very common occurrence for many guitar players. The truth is, practicing guitar takes a lot of dedication, and can sometimes be frustrating. While practicing things on guitar that are difficult, it is easy for your mind to wander and seek gratification from the things you can already play well. This makes you feel better about yourself, so that you don’t feel so frustrated about not being able to play something new. This is very natural, and there is nothing wrong with it… However, if you really want to become a great guitarist, you will need to become 100% dedicated to your musical goals! This means that you must tell yourself ahead of time that you WILL stay focused because your desire for your goals is higher than your desire to distract yourself with stuff you can already play well. That said, remember this: the deeper and more passionate your desire is to achieve your goal, the easier it will be to resist the temptation to play around on guitar during the time you have dedicated to serious guitar practice. Tom’s review and advice: If you want to get the most out of your guitar practice with only a limited amount of time, you will need to practice things that have the biggest overall impact on your playing. For example, if you have a choice between practicing a single string two handed tapping lick and exercises to help you combine scales together with directional picking; you would want to choose the scale/picking exercises because they will help your guitar playing in many different areas at once. By applying this simple strategy in all of your guitar practice time, you will be able to achieve a great deal of progress even though you have only a limited amount of time to work with. Tom’s review and advice: If you want to know what you need to do to get good at guitar, you will first need to clearly define what “good” means to you. In other words, you will first need to determine what your highest guitar playing goals are. Next, you need to take account of all the skills that you will need to possess in order to achieve them. Before I begin training new guitar students, I make sure that I clearly understand what their highest goals are, what the strong areas of their guitar playing are, weak areas, etc. Once these things have been determined, I can then begin to create a strategy to effectively help them. With this in mind, if you want to become a better guitar player in the quickest way possible, find a guitar teacher who knows exactly what you need to learn in order to reach your highest guitar playing goals. Ryan: I appreciate your guitar practice insights Tom. TH: No problem, any time Ryan. Ryan: To the guitar players who read this article, you have surely learned many good ideas for ways to improve your guitar practice. I encourage you to get the most of what you have learned by putting it into practice right now! Find out more on the topic of effective guitar practice by checking out the Tom Hess guitar practice generator site. Ryan Buckner is a shred guitar player, composer and guitar instructor from Oklahoma City. 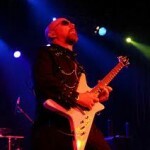 He has created guitar instruction products and written many guitar technique articles for websites and online magazines since 2006.